"Inferiority has been very close to me all my life," he admitted. So how did Brando transcend his sense of inadequacy, find his voice and grow into the formidable stage and screen presence he went on to become? He was probably the greatest actor the world has ever seen but Marlon Brando started out on the streets of New York at 23 years old feeling like a nobody. "I had a great feeling of inadequacy, that I didn't know enough, that I didn't have enough education. 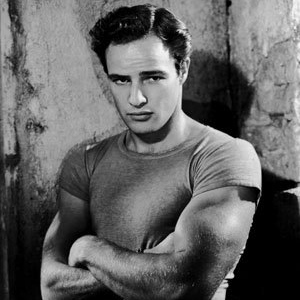 I felt dumb," he says in the posthumous documentary, Listen To Me Marlon (2015). A "very shy and sensitive" child, Brando grew up feeling unloved with an alcoholic mother and an abusive father. "Inferiority has been very close to me all my life," he admitted. So how did Brando transcend his sense of inadequacy, find his voice and grow into the formidable stage and screen presence he went on to become? During the last 50 years, discovering and creating inner confidence has become a multi-million dollar industry with everything from psychotherapy to hypnosis to faking it promising to deliver results. But Brando discovered that, as with acting, living only becomes truly self-assured when you root it in an authentic identity, a brutal honesty -- a character you unflinchingly know the best and worst about and can utterly believe in. Brando learned this winning formula from the mother of 20th century stage and screen acting -- Stella Adler (Feb 10, 1901 - Dec 21, 1992). The less well known but hugely influential actress and acting teacher took Brando under her wing when he became her student at New School, New York, in his early 20s. Adler pioneered the Stanislavski System of acting in America, revolutionizing theater and film with a striking emotional realism. She taught the likes of Judy Garland, Robert De Niro, Elizabeth Taylor, Warren Beatty and Elaine Stritch. But her lessons were as much about life as they were about acting. In the foreword of Adler's book, The Technique of Acting (1988), Brando wrote: "Stella Adler was much more than a teacher of acting. Through her work she imparts the most valuable kind of information -- how to discover the nature of our own emotional mechanics and therefore those of others." In the book, Adler dares us to be bold and true to ourselves. She warns against the pitfalls of middle-class conformist thinking and damns society's "set standards of behavior" as "a straitjacket for the imagination." "When you stand on the stage you must have a sense that you are addressing the whole world, and that what you say is so important the whole world must listen." "Growth as an actor and as a human being are synonymous." "Life beats down and crushes the soul and art reminds you that you have one." "The play is not in the words, it is in you!" In Listen To Me Marlon, Brando remembers Adler inviting him into her home to live as one of the family after his mother's alcoholism became too much. He describes himself at that time as "suffering, disjointed, disoriented," and speaks of Adler as "always very loving towards me." Nobody had ever told him he was any good at anything before but Adler saw his potential: "Don't worry my boy. I've seen you and the world is going to hear from you," she said. This mentor support was pivotal in itself for Brando and his respect for Adler endured his whole life. He served as Honorary Chairman of the Stella Adler Studio of Acting in New York (which continues to this day) until his death on July 4, 2004. In the documentary, he maintains: "All acting today stems from Stella Adler." But some of the most powerful words Adler taught Brando were at the very start of his career when she told him: "Don't be afraid. You have the right to be who you are, where you are and how you are." If you truly believe that, confidence must follow. Brando's legendary line from On The Waterfront (1954): "I could've been a contender. I could've been somebody..." possibly rang so loud and true because, despite being the star he was, he could relate to the inadequacy in all of us from the bottom of his heart. But with Stella Adler's expert tuition and incisive insights he found the freedom and confidence to own the right to be whoever he was, wherever he was and however he was. Certainly his white male privilege must have made that position easier to assume in 1940s/1950s America than it would have been for some, but Brando's early sense of inferiority created an acute awareness and empathy for society's underdogs and went on to inform his commitment to the civil rights movement. The beauty of Adler's timeless advice is that it is for everyone, not just artists, and is especially relevant for those who, for whatever reason, struggle with a sense of entitlement, who feel beaten down by systemic inequality, discrimination or subordination. "Everything that you do, make it as real as you can, make it alive, make it tangible. Find the truth of that moment."